Every year, Women’s World Banking eagerly celebrates International Women’s Day, the event celebrating the advancement of women’s rights all over the world, to draw attention to the importance of financial inclusion in empowering low-income women worldwide. Because International Women’s Day, March 8th, fell on a Saturday this year, we decided to dedicate our Twitter feed to the various ways we have been helping advance women’s economic empowerment through access to financial services and made our program experts available to anyone who wished to ask us anything about the topic of the day. 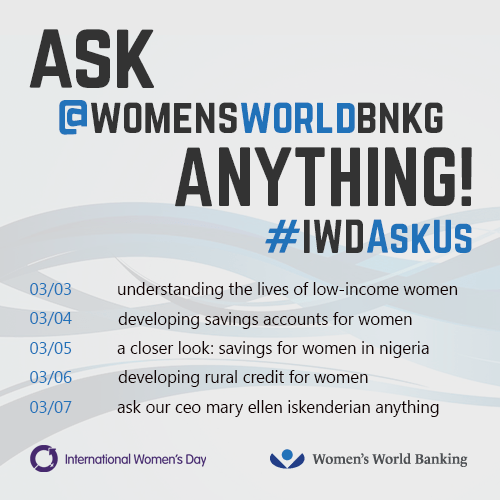 Through this #IWDAskUs campaign, we shared our insights and resources on the lives of low-income women (Monday), how to develop savings products for women (Tuesday), a closer look at a successful savings product in Nigeria (Wednesday) and how to develop rural loans for women (Thursday). On Friday, our President and CEO Mary Ellen Iskenderian as on-hand to answer questions during the culminating day, Ask our CEO Anything. We also hosted an online roundtable of alumni from our Women in Leadership program on “What does it take to be an inspiring woman leader?” recognizing the importance of gender diversity in leadership positions in order to facilitate the advancement of women’s rights in their workplace and in their communities. We’ve created a Storify of the whole week in case you missed one or a few of these days. If you have a question you’d like to ask us, you can always contact us or tweet to @womensworldbnkg. We look forward to celebrating International Women’s Day again with you next year!